Still waiting that my wallet will get a connection and staking. Hope it will do this in the next days, otherwise i have to focus on other coins instead. I need a wallet that works constantly for trading or at least working once in a while for long-term-investment or staking. But so far Denarius is almost never working. Sad - because i see i high potential in this coin, especially because it has a max. supply of 10 millions. But i am a bit disapointed about the wallet so far. Denarius works fine, you need to create the .conf file and add the addnodes to receive connections on Windows if you aren't getting some right after launching it. If you are trying to stake coins, they need to mature for a minimum of 8 hours and then you won't receive rewards until a PoS block is found, which can take around 24 hours. I did this several times but it didn´t work out. I must doing something wrong. see the message from Carsen in this message, close the wallet, delete everything but the wallet.dat file and denarius.conf file you made and reopen the wallet, that should sync it all from the start, i did that it resynced and my wallet started staking about 8 hrs later. It still says - can not stake because wallet is offline. But seems to be we getting nearer what is going wrong with my wallet. Thank you very much for the support. I am a newbie to personal wallets anyway. your arrow might not be green yet, but does it show connections? and a check mark to show you are fully synced? Finally - took a while. Thank you very much for the help! Thank you very very much! 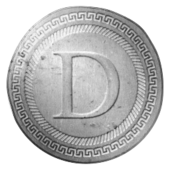 I will invest more into Denarius if stays stable in the future.... that is sure! A coin with a lot potential - that is out of question! The wallet works so fast u get your coins nearly instantly just a matter of seconds! Ensure you are running the latest version of the wallet now too, v1.0.4.0 was just released today, and helps resolve sync issues. You should be able to receive connections by default upon launching Denarius now. Does it take longer for the wallet to stake if there are constandly new small fractions of coins coming into the wallet ? Denarius is 100% clean, its been false flagged by a few anti-viruses as an IRC Bot due to it using IRC to connect nodes. You can clearly see, that John missed the train and wants no other to get in. Haha I'm joking, as Carsen said above the .exe file is clean. You can run a virustotal scan or even analyze it's code with OllyDbg as I did. Then you can see yourself there is nothing suspicious in there.